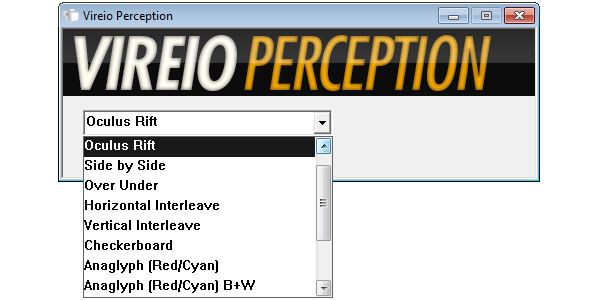 Vireio Perception is an open source stereoscopic 3D driver developed by Andres Hernandez (Cybereality) available for the stereoscopic 3D community to help in its further development and testing. It can work on both AMD and Nvidia-based graphics cards and aside from the Oculus Rift support (including head tracking), the software can also output in Side by Side, Over/Under, Row Interlaced, DLP Checkerboard and various Anaglyph output modes (all outputs are based on shaders that you can modify or extend). can this be used to do quad buffer stereo on PC? or it is for Head mounted Devices only? No it can't, and it is not only for HMD devices, it only supports the Rift. Has this been updated lately?